Spring 2018 update: By John, G8PEF. 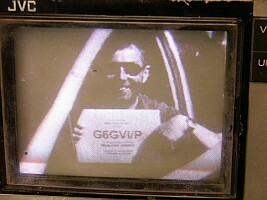 Several members have now built, or are in the process of building, the 'MiniTiouner' D-ATV receiver. This is a fairly simple project to build, all the 'obscure' components and the bare PCB being available from the BATC. In conjunction with the 'MiniTioune' software by F6DZP, it provides a fully tuneable digital TV receiver which covers 143MHz to around 2.5GHz, decoding DVB-S signals at both 'normal' bit rates (say, 2MSymbols/s) and reduced rates (sub 500kSymbols/s). Some members already have the transmit chain well in hand, too - so hopefully there will be some club D-ATV activity very soon. 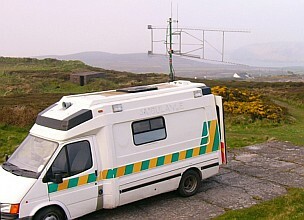 With reduced symbol rates, it's possible to send a D-ATV signal at VHF frequencies, as the required bandwidth is 500kHz or less; the accompanying transmtter - the BATC's 'Portsdown' desgn - is capable of transmitting both 'normal' and low symbol rate signals, across a frequency range of approximately 50MHz to 2.4GHz (although is optimised for 4m, 2m, 70cm, and 23cm) so there is scope for some real experimentation to be done, in the true spirit of amateur radio. The 'Portsdown' transmitter consists of a Raspberry Pi 3 computer, running freely available software, with an optional touch-screen interface. The local oscillator is a pre-built DDS oscillator module, widely available on eBay, etc. and the rest of the project consists of a number of PCBs - a selection of which must be built, depending on the bands required. The main part of the transmitter, the Filter-Modulator board, is quite a complex circuit which can be home built; but unless you are skilled with surface mount construction (or a masochist) then you will probably be better buying a built and tested PCB. These are available (as are the blank PCBs for the other boards) from the BATC. Note that to buy from the BATC online shop, you must be a member - but at £8 for a year's 'cyber' membership (or £7.50/year if joining for 2 years at a time), this isn't a big problem. Of course, the opportunity to build the receiver is open to all licence classes, although building the transmit side of the system is not an option for Foundation Licence holders. Note also that in order to transmit the D-ATV signals on the bands lower than 70cm without upsetting too many people (and fitting in with the bandplans), a NoV to the licence is really required. This will allow operation in the 146-147MHz segment above 2m, or the extra segment above 4m (at reduced bandwidths, of course). Operation on 70cm is not such a problem, as there is much more band to play with, and there is already a fair level of activity up and down the country, centred on 437.0MHz. The RF output power from the Portsdown is quite low (around 10mW max) so some sort of external amplification will be necessary. The amplifier needs to be ultra-linear, so bear in mind that your 'linear' amp suitable for 50W of SSB voice, is unlikley to be able to operate linearly enough for D-ATV if driven to that level - expect to drive your amplifier to a much lower output level (say only about 20% of what you'd expect on SSB) to avoid spurious emissions/spectral regrowth when used for D-ATV. In other ATV news, there is growing interest across the country in WBFM ATV on the 6cm (5.7GHz) band. 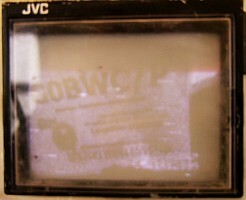 Most activity is with equipment based on cheaply available 'FPV' video sender modules intended for fitting to drones - very similar to the units we at BWC have used in the past for our 5.6GHz WBFM voice equipment for the UKACs. There is a fair amount of interest in the North West; Barrow-in-Furness radio club are active and seeking contacts on the band. There is a clear LoS path from their preferred operating positon to certain spots on Winter Hill, so contacts with them (and with other operators, in N Wales) should certainly be possible if anyone has the gear, or wants to build something and try it out. January 2013 update: the Club now has a video (and audio) streaming facility hosted on the British Amateur Television Club website - click on the test-card above to watch us! Feb 2013 update: the Club has started a series of occasional practical workshop sessions designed to help newcomers get started on ATV. These take place on Wednesday evenings - see our Forum for details. 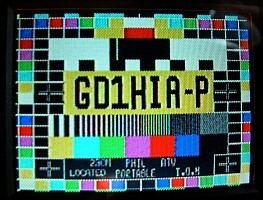 Easter 2009 saw the revival of G6GVI's old FM-ATV equipment for some tests with Phil GD1HIA on the Isle of Man (Ross and Phil both used to live in Bristol where they exchanged ATV pictures a decade ago). Phil now resides on the Isle of Man, and is putting together a remarkable mobile shack, whilst Ross still has the tangle of wires and die-cast boxes which he's always used for portable ATV. Photographs of the small TV screens don't do justice to the quality of the video signals received! 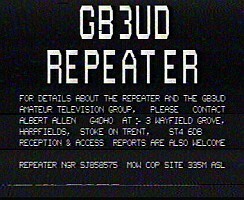 The following day (a Bank Holiday Monday), we put G0BWC/P on ATV for the first time, sending signals again to Phil in GD, and also to Alan 2E0GYO in Ormskirk, Gary 2E0LGZ at Prenton on the Wirral, Brian G3SMU in Bolton and Bill (G3OTW) operating G3NWR from the Wirral ARS Club shack. We also received pictures back from Phil, Alan, Gary and Brian. The BWC crew on the hill included Ross G6GVI, Derek G1AEQ, Jack G8HIK, Jon 2E0CNJ and Mac M0TXR. 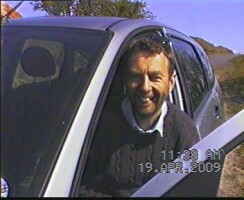 I was back again a week later, when in addition to exchanging more pictures with Phil, I also picked up very clear pictures from the repeaters in Anglesey and Stoke-on-Trent, whilst Phil was receiving the one near Belfast. As well as using the microwave bands (23, 13 and 3cm) to exchange the video signals, 2m FM is often used for audio talkback, so have a listen around 144.750 or watch this space for further developments! 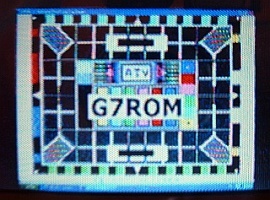 In April 2009, the first-ever 23cm FM-TV signals from G6GVI's home QTH in Bolton were received by Andy G7ROM, using just an old Amstrad satellite receiver with a mast-head pre-amp, and voice talkback on 51.530MHz FM. By June, Andy had improved his receive system so that he could get colour pictures with sub-carrier sound from Ross and Brian G3SMU. 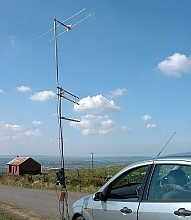 And in June 2009, the Club transmitted 23cm ATV pictures from their GB0SHM Special Event Station at Smithills Hall. 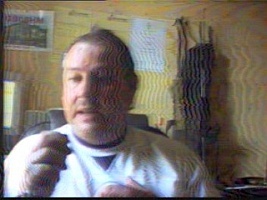 By the end of August 2009, improvements to Andy's station allowed him to transmit his own pictures around the Manchester area, and in 2010 he became a well-known face on the small screen! 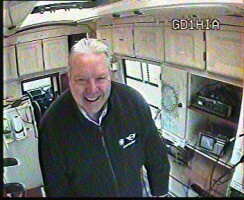 On 10-Mar-2010 Andy and Ross operated the first portable ATV station of the year from Matchmoor Lane. 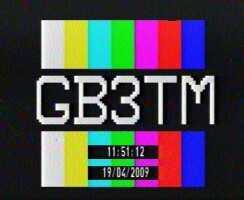 Pictures were exchanged direct with G3SMU and M0ATV, and our video was also seen through the GB3UD repeater, and world-wide via G3SMU's web-stream! As usual, talkback was on 144.750 FM. 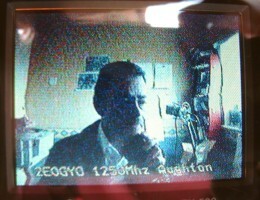 Then on 22-Aug-2010, Ross made contacts on the 23cm, 13cm and 10GHz bands during the BATC Activity Day. 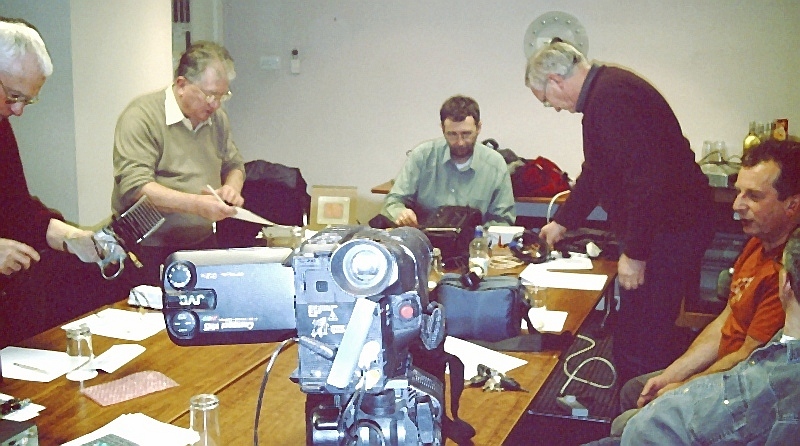 Watch out for new A T V events, and talks in February 2013 by Jim and Derek at B W C and live streaming too ! What topics would you like to cover in our next Wednesday Workshop sessions?